Bailey has been to many dogs shows, but has always ben beaten by he sister, but at last we managed to become Danish Champion, Bailey has not been competing at shows since. She likes bieng at shows, so maybe we will go again next year. 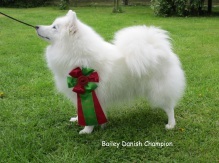 Bailey is a wonderful dog full of energy and love, she is very pretty, always happy and ready for new adventures. She give us so much joy. She likes to be seen and she likes when a lot of things happens, gladly at the same time. If nothing is happening she make op things herself. Too much peace and order is not her. She doesn´t like rules either, she is comstanly breaking them, but she apologizes nicely afterwards.. She is verry cuddly and loves to lie on our lap. Bailey has had 2 litters, she is a good mother and she spent a lot of time playing with her puppies, she is really missing them when they move away.